I don’t oppose what Barack Obama plans to do in Afghanistan. I don’t know enough, and from what I know, I don’t have an alternative to propose. I would have preferred he find a way to achieve American objectives without escalating the war, but I agree with his objective of denying al Qaeda a home in Afghanistan through a Taliban victory, and I hope that his strategy will achieve it. Still, I have my doubts. -- Obama says that in Afghanistan, in contrast to Vietnam, we are not “facing a broad-based popular insurgency.” But if you look at South Vietnam in the early ‘60s, the National Liberation Front, or Viet Cong, did not have broad support. What it had was funding and organization and an ability to build support against what became a foreign invader. It seems that in the Pashtun South of Afghanistan, the Taliban is very similarly positioned. -- In Vietnam, we were hampered by the lack of a government that enjoyed widespread support. In the absence of a popular government that could speak on behalf of the people, our intervention quickly degenerated into neo-colonialism, where the U.S. became, in effect, the government and the adversary of the insurgency. The same thing seems to be happening in Afghanistan. The government has, if anything, lost legitimacy as a result of the recent elections, and the current Afghan armed forces are probably inferior to those of South Vietnam in the mid-‘60s. -- Obama says that in contrast with Vietnam, the U.S. is “joined by a broad coalition of 43 nations that recognizes the legitimacy of our action.” Again, a misleading comparison. During the Vietnam war, the U.S. called the shots but it enjoyed very active military support from other countries in the Pacific region, including Australia, South Korea, Thailand, and New Zealand. South Korea lost thousands of soldiers in the war. I don’t know if there were 43 countries who recognized “the legitimacy of our action,” but I would suspect there may have been. That wasn’t the problem. The problem was that U.S. was pretty much on its own militarily in an Asian country that had long suffered from Western, and then Japanese, colonialism. Its intervention could be cast as a continuation of Western colonialism. In Afghanistan, the U.S. is getting some support for Britain and some other NATO countries, but it is calling the shots. And the countries that are actively supporting the U.S. were active participants in Western colonialism. When the U.S. first went into Afghanistan after September 11, it enjoyed the support of other neighboring Muslim countries, including Iran, as well as Russia. Currently, America’s adversaries could portray its intervention as another attempt by the West to impose its will on a Muslim country. How important are these similarities? In Vietnam, America’s problems were ultimately political. As long as Vietnam’s Communists could portray the United States forces as colonial interlopers, the U.S. couldn’t win. Its support was bound to erode, even after scoring military victories. The U.S. could have a similar problem in Afghanistan. Obama understands this problem. He said repeatedly that the U.S. had no designs on Afghanistan. “We have no interest in occupying your country,” he declared. I believe him, but the question is whether the Afghan people--faced with what will near 200,000 American military and civilian forces--will do so. 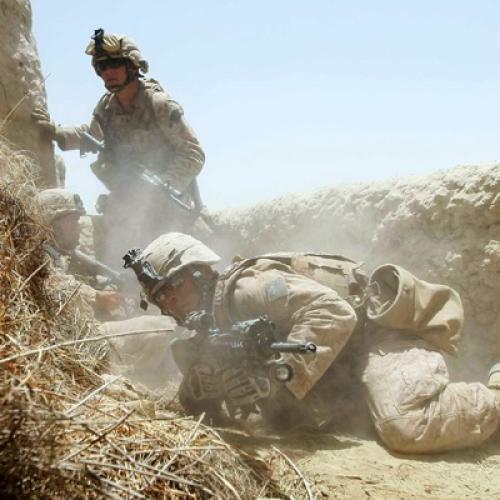 Obama also made clear what his commanders and what other supporters of the war have not: that the U.S. cannot hope to win in Afghanistan by clearly defeating the Taliban the way, say, American armies defeated the Iraqi armies during the first Gulf War. Instead, he spoke of America’s goal as “breaking the momentum” of the Taliban. Breaking momentum is consistent with a strategy aimed at achieving a stalemate and securing an agreement through negotiations that would at the least prevent the return of al Qaeda. But if the Afghan people don’t acquire a government capable of conducting negotiations with the Taliban, then Obama is going to have trouble keeping his promise to begin withdrawing American forces in 2011. If the U.S. has not been able by then to encourage the creation of a popular government in Kabul, then Obama will be faced with the same kind of choice that Richard Nixon faced in 1973. He can agree to withdraw on the promise of peace and reconciliation, while recognizing that as soon as the last American leaves Afghanistan, the Taliban will begin taking over from the weak pro-American government. Or he can go back to the American people and request more troops and more time. And good luck with that. In other words, I don’t see the end game in Obama’s strategy. As it stands, it looks like a choice between remaining in Afghanistan indefinitely and perhaps escalating again or withdrawing and accepting the failure to achieve our objective. I hope things don’t come to that, but I fear they will.